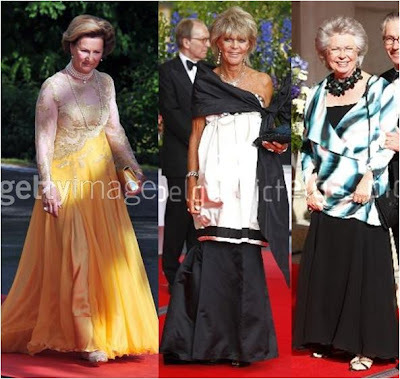 Both Queen Sonja (left) and Princess Christina (right) both turned up in dresses that failed to make anything out of their shapes, but King Carl XVI Gustaf's sister Princess Brigitta (center) ran clean away with the worst-dressed ribbon. This is a little frightening, to be honest. At least we know where Madeleine gets her love of tanning? Princess Alexia (left) recycled a dress we just saw at her father's birthday party. It's a great dress, but disappointing to see it again so soon. Queen Anne-Marie (right) also looked regal in red, but Letizia takes the prize. This stunning creation by Felipe Varela recalls her show-stopping red dress worn at Frederick and Mary's wedding. Yet another reason she should bring more color into her everyday wardrobe! Both Maria Teresa and Beatrix had the makings of great dresses, but covering up like that left them lacking for good shape. Sophie had a great turn in a flattering gown with superb detail, while Cristina went completely minimal to excellent effect. I wish I'd seen what was going on under Tatiana's wrap, but I like the Grecian goddess theme she's working (perfect for a soon-to-be member of the Greek royal family!). Rosario won the day, though - her frock (Valentino, I'm guessing? UPDATE: It's Oscar de la Renta Spring 2010 RTW. Surprising she didn't go with Valentino!) has all the simple grace that Cristina's brought, but the white top adds just the right amount of interest. The color on this is to die for, but up close the details that could have brought a sweet taste of Spanish flair become a wee bit costume-y. Unusual for me to like a NATAN design so much, but Mathilde's fuschia brought a welcome shot of color onto the red carpet, and the shape was surprisingly flattering. Mette-Marit was also pretty in pink, but the ruffly dramatic thing was done better in purple earlier this month. 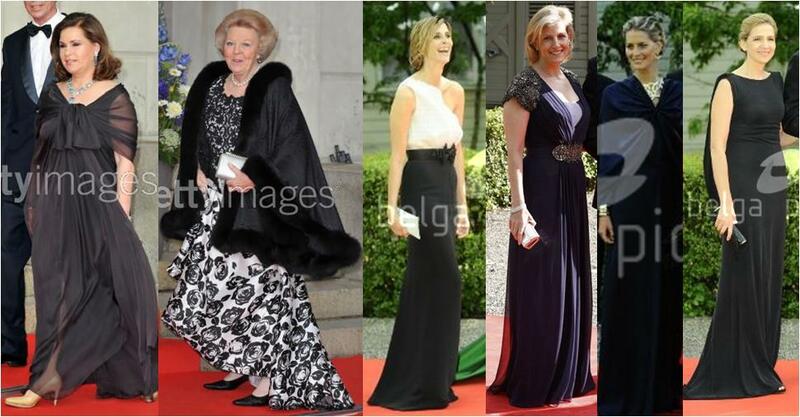 Maxima recycled a Valentino Couture gown for the occasion. I'm always torn on this one; sometimes it looks too much like a shabby chic lampshade to me, and sometimes the detail feels just right. Tonight, I'm digging it. 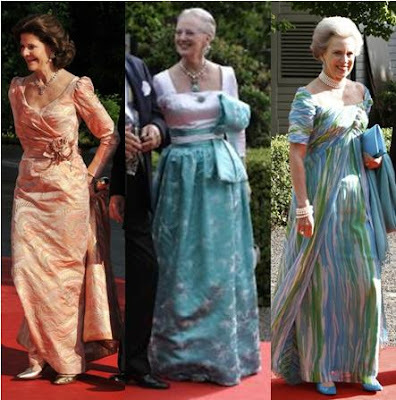 Queen Silvia (left), Queen Margrethe (center) and Princess Benedikte (right) were all delightfully summery in pastels tonight, but Benedikte has done the stripey candy thing too recently and Margrethe is sporting another repeat from Constantine's birthday. The mother of the bride wins the prize in this elegant peach gown. 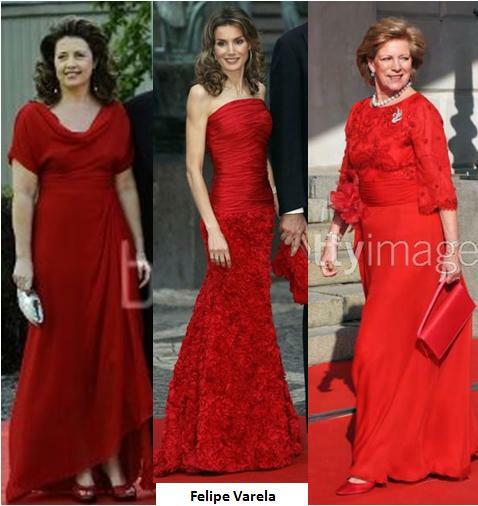 Even Märtha Louise brought out the elegance tonight! She's lovely in the palest of lilacs. Mary is wearing a new dress, fantastic detailing, but a little too pale for her. At first I didn't like Madeleine's dress (the pattern detail is a little immature) but it grew on me, and I especially love that she's wearing the Carl XVI Gustaf fringe tiara as a necklace in addition to a diamond decoration at the back of her hair. Charlene Wittstock looked a little uncomfortable at her first major royal event, but she shouldn't have: her Armani was quite elegant. More accustomed to attending royal events is Prince Gustav's companion Carina, who looked the best of them all with just enough sparkle on the bodice of her light dress. Please - like there was even any competition! Elie Saab's Spring 2010 Couture collection is my current favorite (in fact, I already had it planned for the next Runway Mondays post! ), so this dress gives me the jumpy claps. Victoria has never looked so good. A perfect dress for the center of attention, and accessorized to the nines with AMAZING diamond earrings and the cutest cupid's arrow shot through her hair. Oh, this just gets me even more excited for what we might see tomorrow! Who was your best dressed tonight?